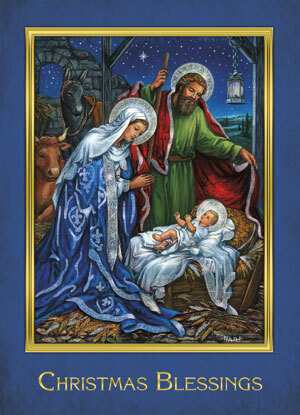 These beautiful Christmas cards feature religious art and will be well appreciated as a inspirational greeting for the Christmas season. 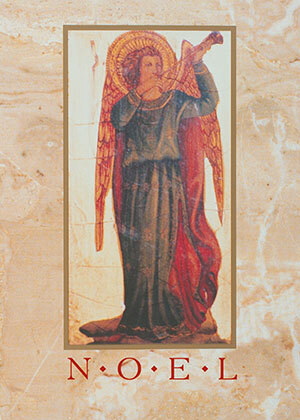 All of these card designs include the Mass remembrance copy for Priests. Most of our Christmas card collection is embellished with gold stamped, embossing, glitter or die-cutting to enhance the beauty of the cards. 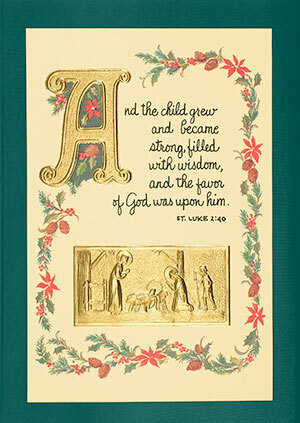 Inside Verse: As we remember His birth, may you be blessed with His Peace, this Christmas and everyday of the New Year. 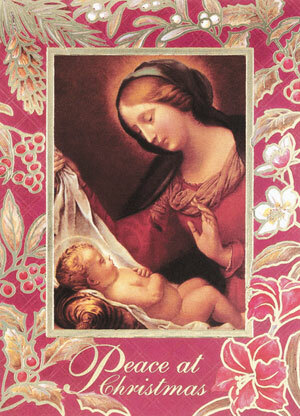 It will be a great joy to remember you and your loved ones in Holy Mass throughout this Christmas Season. 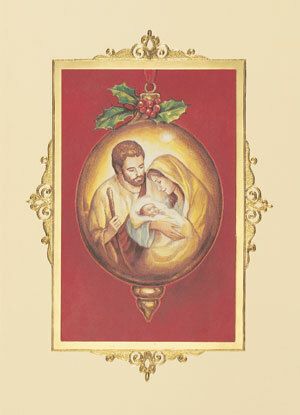 Inside Verse: As a Christmas gift, you and your loved ones are being remembered in Holy Mass throughout this Christmas Season. 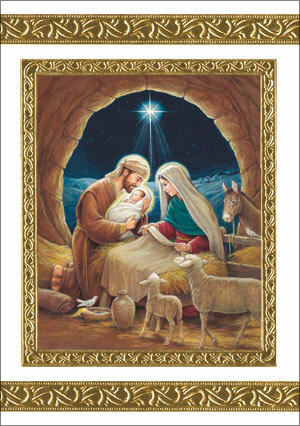 May the celebration of the birth of Jesus bring you peace and joy. May the New Year bring you many blessings. 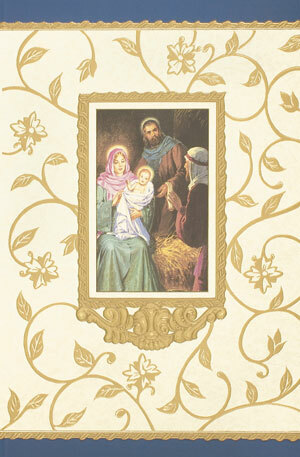 As a Christmas gift, you and your loved ones are being remembered in Holy Mass throughout this Christmas Season. Wishing you a glorious Christmas filled with peaceful moments and joyful memories. Inside Verse: “And this will be a sign for you: you will find a baby wrapped in swaddling cloths and lying in a manger.” As a Christmas gift, you and your loved ones are being remembered in Holy Mass throughout this Christmas Season. May the Glory of the first Christmas fill your life with Peace, Joy and Love. May your heart be touched by peace, love, and happiness this Christmas and always. 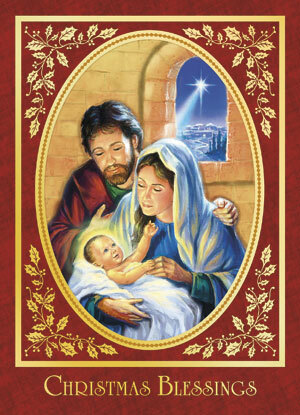 Inside Verse: It will be a great joy to remember you and your loved ones in Holy Mass throughout this Christmas Season. May He bless you with peace and happiness all through the year. 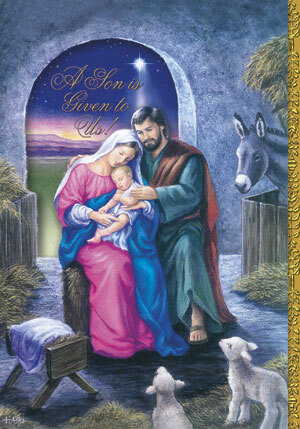 Inside Verse: “For unto us a child is born, for unto us a son is given.” – Isaiah 9:5. 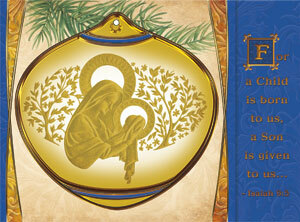 May Christ come to you this Christmas with the gift of Love, the blessing of Hope, and the promise of Peace. Inside Verse: May the peace and happiness of Christmas be yours today and every day throughout the coming New Year. 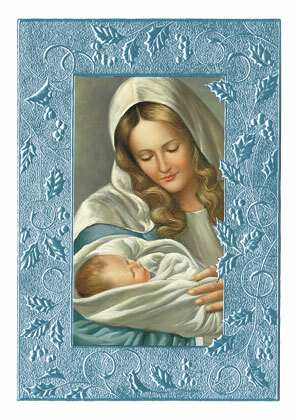 May the blessings of the Christ Child be your this Christmas and throughout the New Year. Inside Verse: Wishing you all the Blessings of Christmas. 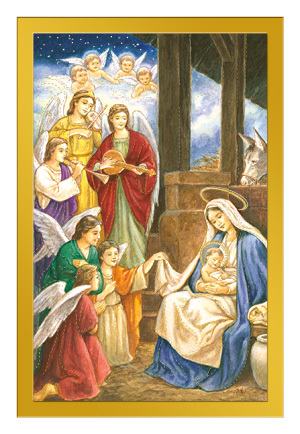 Inside Verse: As a Christmas gift , you and your loved ones are being remembered in Holy Mass throughout this Christmas Season. 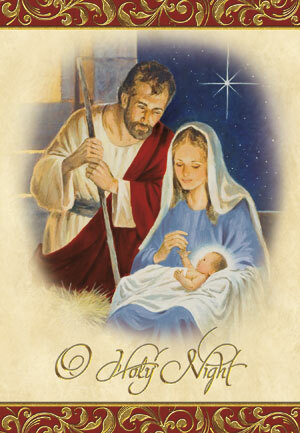 As we remember His birth, may you be blessed with His Peace this Christmas and every day of the New Year. Inside Verse: May you have the gift of Faith the blessing of Hope and the peace of His Love at Christmas and always. Inside Verse: Wishing you a glorious Christmas filled with peaceful moments and joyful memories. 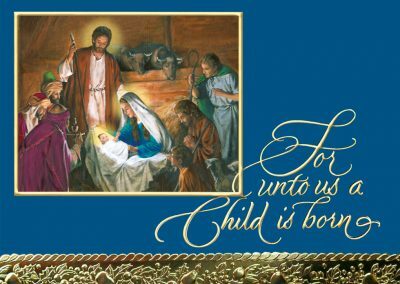 Inside Verse: A Son is Given to Us! 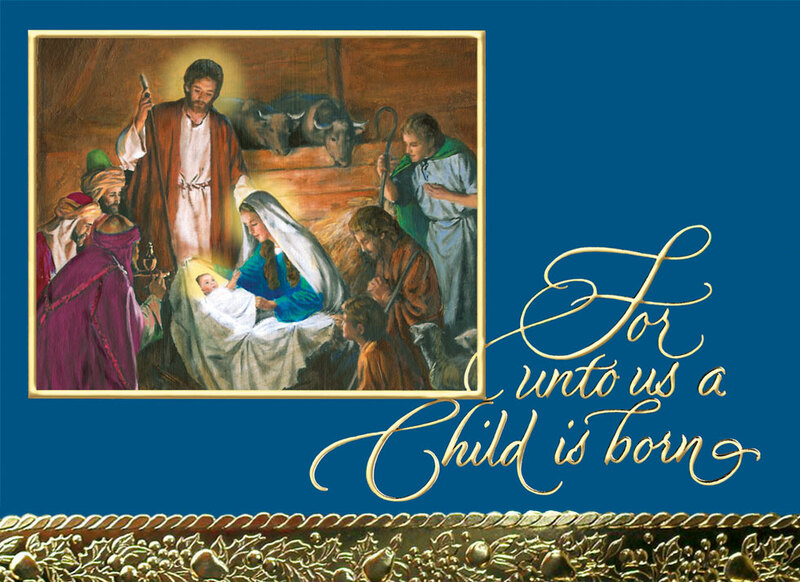 May the blessings of the Christ Child be yours this Christmas and throughout the New Year. Inside Verse: May your heart be touched by peace, love, and happiness this Christmas and always. 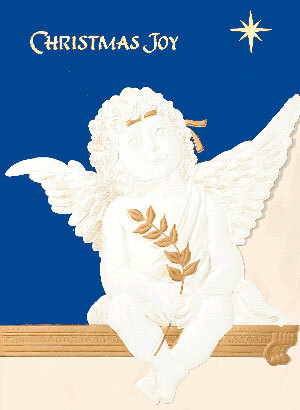 You and your loved ones will be remembered in Holy Mass throughout this Christmas Season. Available Blank/No Copy or with your own imprinted custom copy. 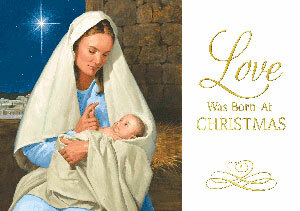 As we are blessed by His birth, may we also be blessed with His peace. 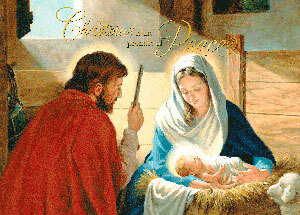 May God’s peace be your gift this Christmas. Inside Verse: Wishing you all the blessings of Christmas and a New Year of peace and happiness. 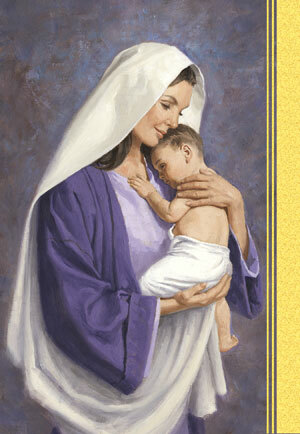 May His love fill your heart with gentle peace.